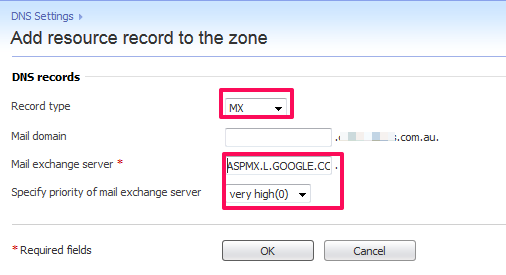 The following document describes how to add MX records if you are hosting your e-mail with Google. Note: This article is based on the assumption that you have a Google Apps account where all mailboxes are already created. Note: It may take 24-48 hours for the DNS record changes to propagate. Log into cPanel for the account you wish to make the changes to. Click theMX Entry link from the email section. 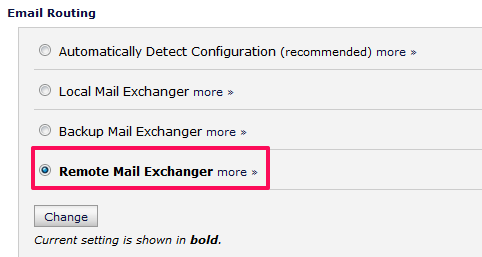 Select Remote Mail Exchanger in the Email Routing section.Click onChange. In the Add New Record section, enter the first MX record and click on Add New Record button. 4. Similarly, add all 5 MX records. Once added, the records should reflect the Google records as shown below. Note: If you find any other MX record apart from Google records, delete it by click on the Delete link. Log into your Parallels Plesk Panel account. Note: If the priority dropdown menu doesn’t have exact priority as provided by Google, use the closest priority. E.g. the dropdown menu does not have priority 1 – so you can use priority 0 instead. You will see a confirmation message; click on the Update button to confirm the DNS modification. Once all the records are added, the records should match with the records provided by Google. Note: If you find any other MX record apart from Google Apps records, remove it.